The SAP® User Experience Management application by Knoa provides the visibility to drive adoption and optimize your workforce. SAP UEM offers insight on how employees interact with SAP applications, helps measure impact on day-to-day operations and ultimately, increases adoption to realize efficiencies and save money. Organizations can identify complexities of key business functions, and deliver a roadmap to enable users to be more productive, responsive and engaged. SAP UEM by Knoa optimizes the performance of your SAP applications and the people using them. SAP UEM offers insight on how employees interact with enterprise applications through the collection and consolidation of data – separating real problems from subjective opinions - allowing you to identify specific areas for improvement and take corrective action to ensure the maximum return on your software investment. SAP UEM by Knoa is available for on-premises deployment or as a cloud-based subscription service, with the same range of metrics and analytical capabilities available for both. In addition to Knoa’s SaaS offering, which is delivered on the IBM Cloud platform, you can deploy Knoa on your cloud platform of choice, including Amazon, Azure, or SAP HEC. SAP UEM aggregates the data you collect, making it possible to gain executive insights at the highest level, as well as problem solving detail at the lowest level. You can generate reports for key functions in your company including training, user support, IT support, and change management. Where user performance does not match best practices, you can retrain. Where the application itself could do better, you can reconfigure. The SAP UEM reporting console, powered by SAP BusinessObjects, delivers the Knoa data in hundreds of out-of-the-box actionable dashboards and interactive reports. A robust alerting module can be configured for proactive remediation of issues. Knoa’s user analytics platform is highly extensible by customers and partners alike. Knoa data can be accessed through APIs, for integration with other enterprise monitoring solutions or custom visualizations using your BI tools of choice. Supported database platforms include: SAP HANA, MS SQL Server, and Oracle. A development toolkit enables you to extend the Knoa UEM monitoring capability to non-SAP or custom applications. 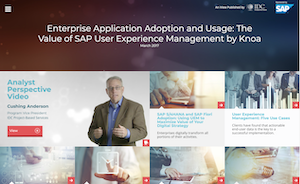 Visit the SAP User Experience Management by Knoa product page on SAP.com.